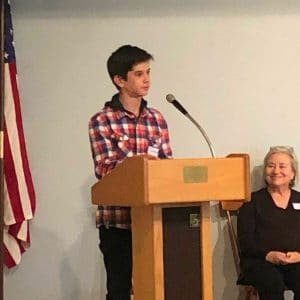 In December, Maine Coast Waldorf School ninth graders submitted short stories for the Second Annual Freeport Historical Society Writing Contest that focused on the current exhibit’s theme of blacksmiths and shopkeepers. 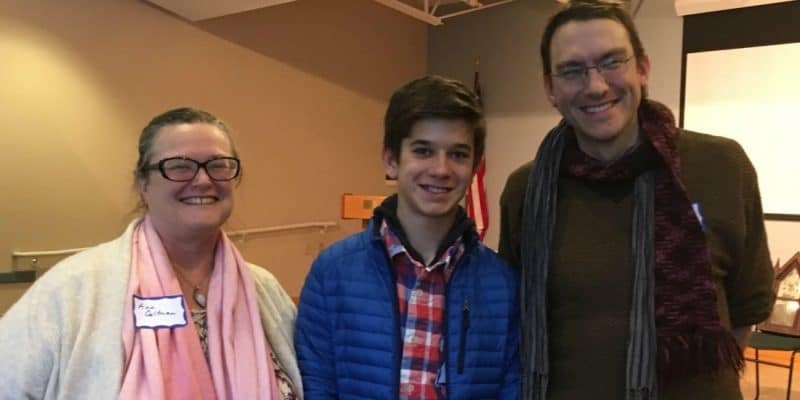 Freshman Wes Teegarden’s story won first place in the high school category, and German and Humanities teacher Ann Coltman took home second place in the adult division for the second year in a row. High school Humanities teacher John Reinhart won an honorable mention. The winners presented their stories at a recent celebration at the Freeport Community Library. Over cake and coffee, attendees heard Wes’s tale of a boy whose parents sent him north to avoid the violence of the Civil War and Ms. Coltman’s story about a young woman who returned home late to find both the family clocks stopped at precisely 6:10. MCWS Freshman Wes Teegarden reading his winning story.